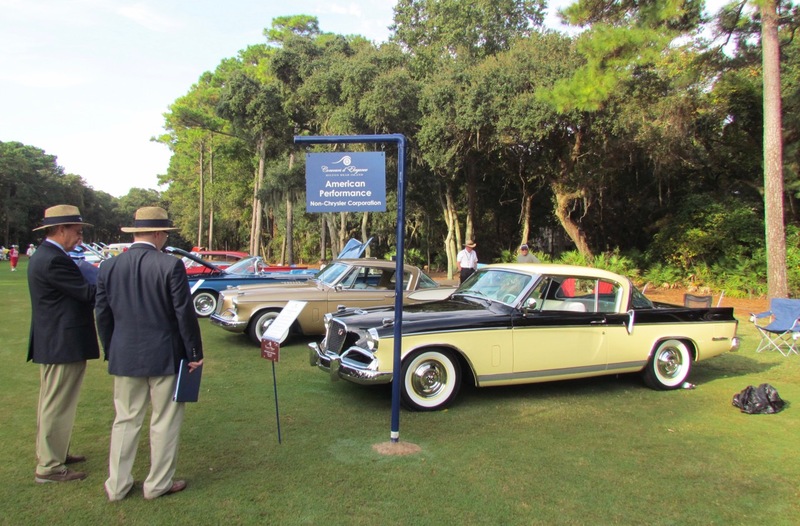 After all those childhood Sunday School lessons, I accepted an invitation to serve as a guest judge at the Hilton Head Island Motoring Festival and Concours d’Elegance. 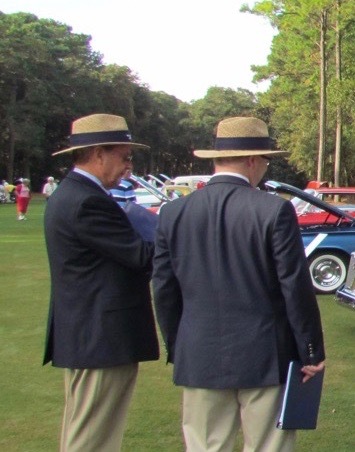 After all those childhood Sunday School lessons, it was with considerable trepidation, but also with a reporter’s considerable curiosity, that I accepted an invitation to serve as a guest judge at the Hilton Head Island Motoring Festival and Concours d’Elegance. Like so many people who attend such events, I’ve seen the judges dressed in their blazers and straw hats, clipboards in hand, as they perused in seemingly excruciating detail each of the vehicles, parked on the lawn by a car owner seeking to take home best in class honors, or at least some sort of physical evidence that all that money spent on the vehicle and its preparation and its transport to the show and all that time spent on cleaning and polishing and even picking the blades of grass from between the tire treads the morning of the event were worthwhile. But how, I always wondered, how do the judges judge those vehicles? What are the criteria? Do they really check every nut and bolt for being factory correct? Do they give bonus points if the car comes with a good story? Do they deduct points if the car is parked with its steering wheel cockeyed? Being a former magazine editor, and writing about cars for newspapers and websites, I’d done some car-show judging in the past. For example, the Orphan Car Show – held each fall in Ypsilanti, Michigan, and open to vehicles whose makers are no longer in business (think Studebaker, Packard, DeSoto and other domestics, or import brands such as Citroen, MG and Triumph, which no longer sell vehicles in the U.S. market) – asks automotive journalists to do its judging, which is based less on the quality of the vehicle but almost totally on the quality of the story about the car shared by its owner. Even if we can’t tell if a carburetor carries the right serial number or remember the thread count on the carpet originally installed in every vehicle ever manufactured, journalists are trained and paid to recognize a good story when they stumble across one. But at a concours d’elegance, judges are expected — and rightly so — to be automotive experts, and downright demons of the details. I learned that while guest judges don’t face the same scrutiny, we nonetheless have to be approved by a certified senior judge, that our effort is governed by the same judges’ code of ethics (yes, there is such a document), follow the same judging guidelines (of which there were a dozen printed out for us), and judge under the same criteria as at other major concours where authenticity and historical correctness and the condition of the entire vehicle are considered on a 100-point scale, with an allowance for bonus points based on elegance. 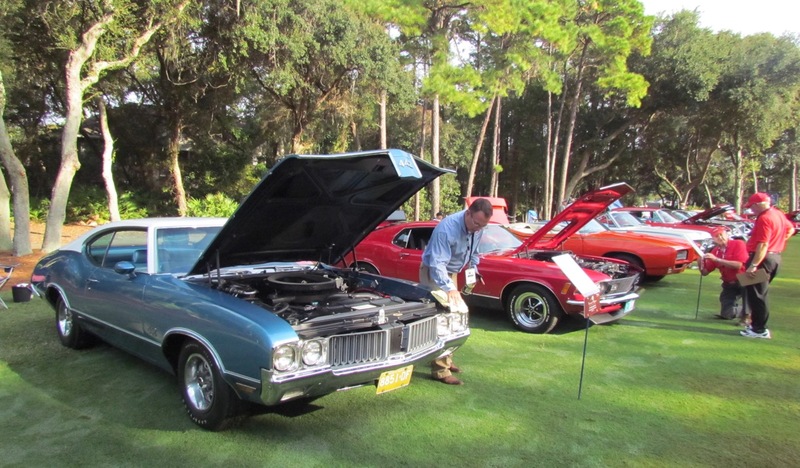 I also was asked which classes I might be qualified to judge and was assigned to Class 06: American Performance, Non-Chrysler, which at Hilton Head included eight vehicles produced between the late 1950s and 1970 (Chrysler being the featured marque at the concours, there was a separate class — 03C — of its performance cars). I received photos and notes about the cars in the class I would help to judge. Oh, I also learned that judges not only wear blue blazers, but white shirts and ties and, at Hilton Head, khaki pants (which I hadn’t worn in maybe 20 years, so I went shopping before flying from Phoenix). The event chairman told us that good judges provide inspiration for the car owners regarding their vehicles and their presentation. The chief judge then reviewed our ethics, the judging guidelines, shared various logistic details, and explained that our job was to award best in class and what are called Palmetto awards (to one or two cars per class worthy of special recognition less than best in class). He also said that this year, after all the best in class awards are made, the head judge and five senior judges would then select the best of show from among them. With some 180 cars in around 30 classes, we also were told that our work needed to be done by a certain time, which in our case meant that we could allot about 15 minutes to consider each car. I would be working Class 06 with and learning from and trying not to interfere too much with or do anything that might embarrass two experienced judges — Dale Moss and Rob McLeese. Moss has long history with cool and classic and collectible cars; Don Yenko was his SCCA driving instructor. McLeese is chairman of the Cobble Beach concours, which generally is considered the Canadian version of Pebble Beach in California. As we walked to the show field, Moss and McLeese underscored for me the importance of elegance. “We look for perfection,” one of them said. They also explained that, “We never touch the car.” Instead, the judges ask the car owner to open the hood, doors and trunk for closer inspection. Ah, but while they didn’t touch the cars, Moss and McLeese looked at them from seemingly every angle, in some cases kneeling on their notebooks to protect those khaki-covered pants from grass stains while looking beneath a chassis. One of my duties was to stand behind each car and given an appropriate thumbs up or down as the owner was instructed to start the car, turn on the lights, flash the brights, and demonstrate that the brake lights and turn signals worked. I also was impressed by the way my experienced teammates asked the owners about each car’s history and if there was anything special about the car that wasn’t obvious to someone seeing it for the first time. Moss and McLeese reminded me that each judge makes a point of thanking the owner for bringing the car, that each judge can ask questions of the owner, and that the judges move well away from the car and its owner as we converse among ourselves before marking our judges’ score sheets. I was impressed by how much they knew, and about how much you can learn about a vehicle by spending just 15 minutes with it and its owner. I was surprised that even a rookie guest judge can learn to identify and note praises and problems alike. I felt good pointing out to the experienced judges that the cupholder in one car was an aftermarket item, not factory installed, and that another was wearing the wrong brand of tires. I’d not go anywhere near that far, but it was a great experience. I learned a lot, and flew home with newfound respect for the men and women in the straw hats and blazers.